We have brought up for you the list of the top Agile project management tools along with the highlights of each tool. 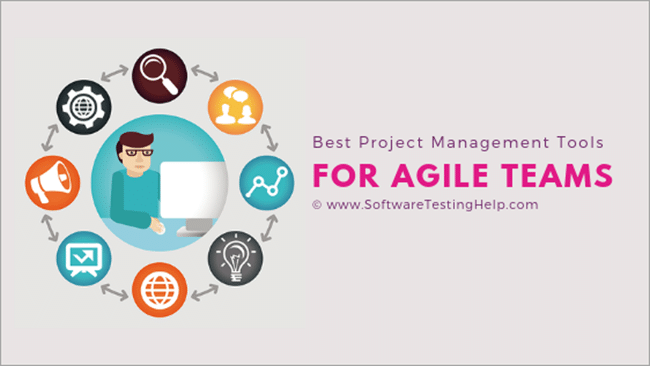 As Agile is one of the most popular and in-demand software development methodology these days, we are sure that this list will be very helpful for you to decide, choose and learn about the agile project management software that can be used in your project. Before we delve into the tools list, it is quite important for you to understand the concept of Agile. If you go with the literal meaning of the word Agile, it means – “able to move quickly and easily”. The same meaning applies here when we talk about Agile in terms of project management or software development. Agile is a project management methodology, mainly used for software development, which is attributed to the division of a whole task into multiple smaller tasks and attach them with the short & incremental phases of work known as sprints. The main intention behind this approach is rapid & early delivery, frequent reassessment & adaptive planning, continuous improvement and flexible response to change. Assuming that you have now got the basic idea of Agile, let’s move forward and explore about Agile project management tools. => Contact us to add a listing here. Here we go! Let's see more details with the comparison for these Agile Tools. Hygger – is a project management tool with built-in prioritization. A perfect solution for Agile teams in any sphere. Establish specific project goals and break them into an actionable plan. Create and share beautiful roadmaps, distribute tasks on Kanban boards and prioritize them wisely using Value/Effort matrix or other technique. Coordinate and collaborate with the team in real-time and enjoy full transparency of work. Hygger is a perfect tool for software development, product management, marketing, creative agencies, and others. WIP Limits. Limit the number of tasks in progress to focus your team only on current tasks. Prioritization. Set clear priorities on what task to do next. Swimlanes. 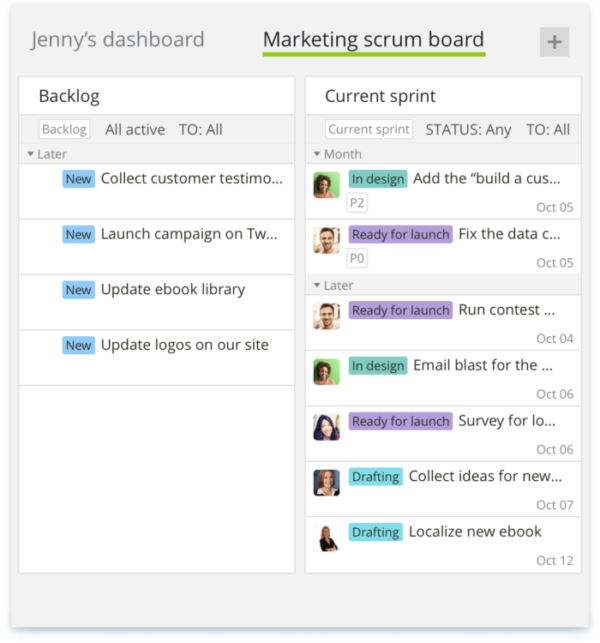 Separate the tasks on boards by horizontal lanes. Labels. Categorize your tasks and then filter them using a quick labels filter. Time Tracking with Reports. Track your team's efficiency. Due Dates. Set up the deadlines, not only time estimation. Wrike is an online, agile, and real-time project management application that boosts communication among the teams. Its simplicity and responsibility make the users achieve the results on time. Wrike is mainly used in mid-sized or large projects. Wrike gets integrated with all devices like Android and iPhone etc. through which the users stay updated on open projects as well as completed projects. It is too expensive for small companies and projects. SpiraTeam® is a complete agile software development management system that manages your project's requirements, releases, iterations, tasks and bugs/issues. Designed specifically to support agile methodologies such as Scrum, Extreme Programming (XP), DSDM and Agile Unified Process (AUP) it allows teams to manage all their information in one environment. In SpiraTeam, each project has a dashboard home-page that summarizes all of the information regarding the project into a comprehensive, easily digestible form that provides a “one-stop-shop” for people interested in understanding the overall status of the project at a glance. It contains summary-level information for all types of artifact (requirements, test cases, incidents, etc.) that you can use to drill-down into the appropriate section of the application. => Start Your 30-Day Free Trial Today! No doubt, Atlassian JIRA is one of the best project management tools used by Agile teams. Ideal for most offices. Mainly- IT professionals, institutional designers, working in a shared environment. Customizable Scrum Boards that can make to fit according to your team’s workflow. These scrum boards are used to visualize all the work in a sprint. Any backlog moves automatically to the newsprint. Flexible Kanban boards for continuously delivering maximum output at minimum effort. Out of the box agile reporting that shows the real-time image of the sprint with the help of burnout chart, sprint report, a cumulative flow diagram, velocity chart, epic report, release burn down, etc. Custom filters using JIRA Query Language (JQL). On the go mobile apps that ensure an uninterrupted flow of work. It is highly extensible and extremely customizable as per your project needs. It is a mature and proven product used by thousands of big companies around the globe. So, it has a large and active community. A lot of out of the box features bring in long-term benefits to the project. Very helpful for start-ups as it is cheap for small teams. It is hard to setup and takes a long time to learn using it properly. Many core features are available only as paid add-ons. Too many features make it complex to use for some teams at times. Cloud: $10 per month for up to 10 users for small teams and $75 per month for up to 15 users for growing teams. Self-hosted: $10 as a one-time payment for 10 users on the server and $12,000 per year for 500 users on Datacenter. This is yet another powerful agile project management tool. Task management: All the work is in one place. We can track all the updates by looking at the dashboard. Task filtering: Immediately searches what you want. Great team collaboration with features like All-in-one calendar, @mentions, and collaborative writing. Time tracking: Log time on projects, the timer app, time tracking reports. A reliable tool with a lovely interface. Rich features with moderate price. Does not have a sprint planning option. Have few issues with customization. Cloud: $25/month for 5 members with 5GB space and $299/month for any number of members with 500 GB space. Self-Hosted: $999 a one-time payment. Ideal for teams that require powerful communication. Offers real-time intuitive workflow for Agile projects. Organizes the product backlog efficiently with features like user stories, higher level themes, prioritization, and overview on product ongoing process. Supports sprint panning 1 & 2. One click approval of completed stories. € 10/month for single teams and € 20 per month for multiple teams. Ideal for the web and mobile developers. Helps in develop and keeping track of all the stories from start to deliver. Several point scales for estimation & prioritization. Automatic planning based on velocity. Multi-project workspaces where all responsibilities are seen on one screen. Analytical representation of team health through project trends, burnup, cumulative flow, feat, cycle time report, released reports, etc. Other features: Notifications, Mentions & following, Search, file sharing, labels, tasks, API, story linking, project history. Below are some screen-prints that will show you how the API, workspace, and story management screens look like. Offers a lot of integration options to extend the functionality. All the main things can be tracked on a single page view. Difficult to maintain dashboard for a large team. Free for team size up to 3. Free for public projects, educators & non-profits. Startup: $12.50/month for 5 collaborators & $29.10/month for 10 collaborators. Connect to code- all code changes get linked directly to tasks/bugs. A complete & powerful agile project management tool. It has almost all the functionalities that are needed to support scrum team – Backlog management, capacity management, Kanban, scrum boards, etc. Build, test and release steps can be set up quickly. Easy to use and graphically appealing. Available only on the web. No Android or iOS version is available. iceScrum is a truly agile project management tool. It is built on a free and open-source agile core that can be enhanced with 40+ apps & integrations. True visibility through user stories. Reports – burndown charts, cumulative flow, project cost, etc. No need to register – sign in through yours google or yahoo account. No cons have been observed as such. Free for public and open source projects. Task management: you can prioritize, categorize, order, filter and search tasks. Does collaboration among team & tasks in real time. Organizes ideas, suggestions, questions and feedbacks. Clear visual overview of the things happening in the project. Supports both scrum & Kanban. Great for software development projects. Limited file storage regardless of plan. Free up to 3 users, 2 projects with 50 MB storage. Starter: 8 users, unlimited projects, 1GB file storage – €24/month. Business: 20 users, unlimited projects, 2GB file storage – €59/month. Business: 21+ users, unlimited projects, 5GB file storage – €5/user/month. Ideal for IT professionals & tech-savvy designers. Supports methodologies like scaled agile framework, Kanban, DAD, LeSS, Hybrid approach. The free version is very limited. A web-based agile project management tool for managing multiple projects. External integrations such as: Slack, GitLab, GitHub, Travis CI, Semaphore, etc. Ideal for content developers from various verticals. Too many functionalities for small projects. Paid version starts from $19/month/private project for up to 25 members. Apart from these above 10 tools, there are some other very good tools which are worth to mention when we talk about agile project management. Since agile is one of the widely used and most popular project management and software development methodology these days, there are a lot of agile project management tools available in the market. The above list will surely help you to choose the best project management tool as per your needs. As almost all the above tools have a free trial version available, I would suggest that you should try the tool once & explore its features before making the purchase decision. If we have missed out any tool here that you think aids in agile project management, your suggestions and experiences are most welcomed!